Combat Rising Interest Rates – Buy Modular! 10 Jun Combat Rising Interest Rates – Buy Modular! A strong economy and low unemployment generally mean that people have to pay more for goods and services. It also means that interest rates start to rise. According to Freddie Mac, mortgage rates are now at an all-time high. Rising interest rates coupled with a housing shortage are causing home buyers to become discouraged. Thankfully, there is an alternative that many haven’t yet considered that gives you quality for less money and less money borrowed means less interest paid. People are often first drawn to modular homes due to their lower cost and then become true converts when they realize the quality of what they are getting. Strict tolerances are required in the building of the different modules so that the whole fits together securely when assembled at the building site. 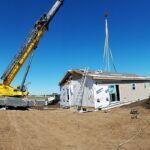 Not only do modular homes have to meet local building codes, but they are also subject to stringent quality control guidelines implemented during manufacturing. Typically, a modular home costs about 15% less than building the same floorplan in a traditional manner. The reason modular buildings cost less is that there is less construction waste during the fabrication process. The only difference between a modular home and a stick-built home is where the building takes place. Apart from that, a modular home increases its value over time. So lower building costs mean you have more equity in your new home from the very beginning. How do I get a new construction loan started? The construction loan process begins with pre-approval. Make an appointment with your bank and gather tax returns, income statements, and any paperwork on existing debt that you might have. The bank will run your credit history and let you know which interest rate you might qualify for on your loan. They will also give you an amount they are willing to lend as part of the pre-approval process. Knowing how much you can borrow allows you to start looking for land. You can also start browsing through modular home floor plans. Once you’ve settled on the site and layout of your new home, your modular home builder can give you a final quote which you will then take back to your bank for final approval. The bank will review all of the paperwork and order an appraisal to determine the future value of the home. They will want you to have at least 20% equity in the deal. After all the paperwork for the loan is finalized, your builder can schedule your build. Then you can purchase your land. Don’t Let Rising Interest Rates Discourage You! 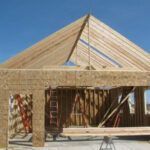 If you plan to build a home within 75 miles of Goshen, Indiana, then you need to call Next Modular. Compare prices and learn how you can customize just about any floor plan. Don’t let rising interest rates discourage you from your building your dream home.